Nightly was first to take the stage at the DC9 Nightclub in Washington, DC on May 26th. Originating from Nashville, Tennessee, this four piece released their debut EP, titled Honest, in October 2016. Before the co-headlined summer tour, the band supported acts like The All-American Rejects and K.Flay. From the beginning of their set, the band had people moving on their feet. The dedicated fans up front knew every lyric and sparked recognition from the eyes of Johnathan Capeci (vocals) and Joey Beretta (guitar). While they admitted to having few released songs, Beretta was happy to let the crowd know they would be playing some unheard music. Despite the small stage, the band’s energy soared. Beretta exuded a strong, unbridled passion and dominated the room with his stage tricks, leaving no surface on stage untouched. The last song played was XO, a fan favorite that embodies the band’s revolutionary sound. Nightly’s music is irresistible in their anthemic lyrics and infectious guitar riffs, both of which do not escape your head for days. The crowd anxiously waited over an hour between sets for Urban Cone to grace the stage. 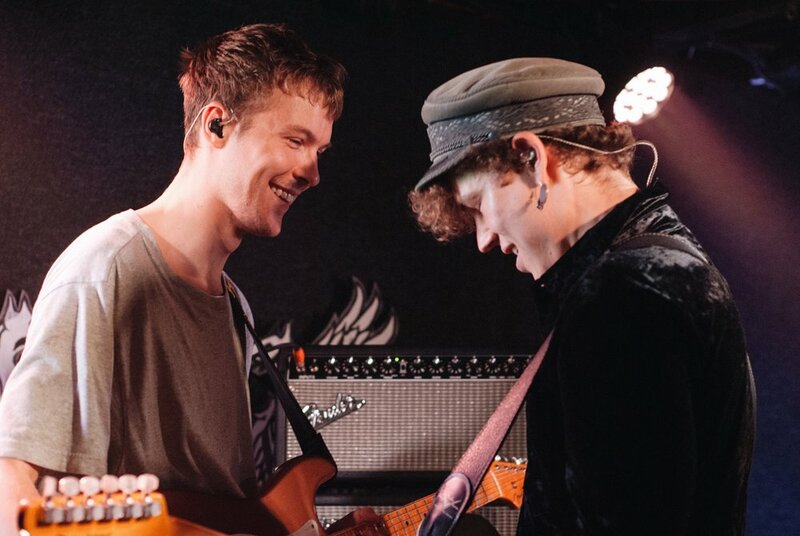 The band, made up of Rasmus Flyckt (keyboard, vocals), Emil Gustafsson (lead vocals, bass), Tim Formgran (guitar) and Jacob William Sjöberg (keyboard), have toured with the likes of Tove Lo and The Griwswolds while promoting their previous albums, Our Youth (2013) and Polaroid Memories (2015). Hailing from Stockholm, Sweden, the electro-pop group impressed the crowd with their European style, coy humor, and irresistible charm. Gustafsson and Flyckt took to the stage like naturals and created an environment that immediately convinced onlookers to dance along to the music. The setlist was a perfect balance of new songs and older, more recognized tracks. Starting with Sadness Disease, the show was off to a great start. There was never a point when the crowd lost energy. Each song after the next was as ridiculously catchy as a Top 40 hit. The professional lighting made the stage feel twice the size and the band’s personality peeked through between songs with comments on their love for Washington D.C. Before anyone was ready for it, the encore was to be performed. The first song released for their upcoming album, Old School, finished off the set with a bang! Everyone was dancing, singing, and having a memorable time. The night was filled with fresh music that deserved more than a crowd of 200. Nightly and Urban Cone are both headed for greatness with their music forging a new wave of alternative pop. Check out our gallery of the show taken by Bethany Camp.